Friday Concerts in the Park goers gather around the pavilion at First and Main streets. 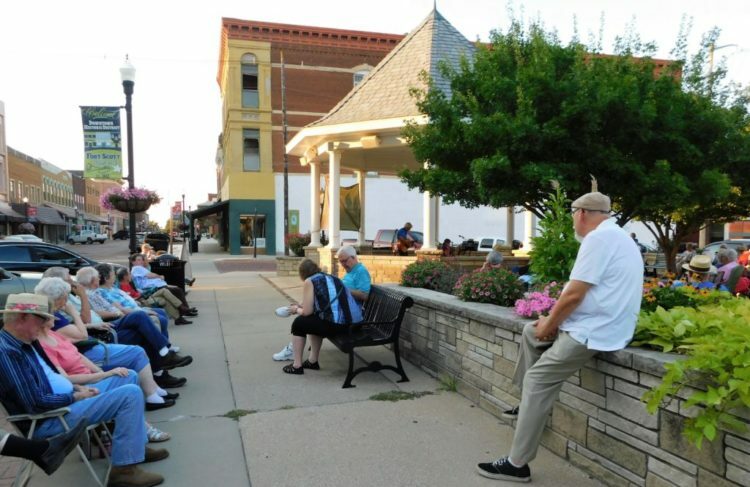 This Friday’s Chamber of Commerce sponsored concert will feature the Workman Bluegrass band. 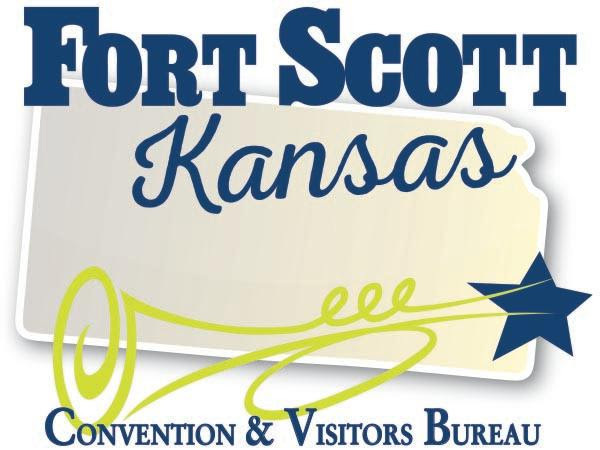 Fort Scott KS – Saturday, September 1 through Monday, September 3, 2018, Fort Scott National Historic Site (FOSC) will commemorate Labor Day weekend with artillery, horses, music, living history demonstrations and a series of interpretive programs. All programs are free. 2:30 p.m. Free ice cream, served to honor all those who have worked hard to build America, courtesy of the Friends of Fort Scott National Historic Site. The thunder of artillery will sound each day at 11:00 a.m. and 3:00 p.m. with a short program explaining how the gun is fired. 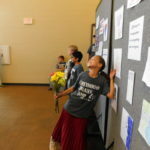 Other programs offered throughout the weekend are Guided tours at 1:00 p.m. and a flag retreat ceremony at 4:00 p.m. occur each day. On Saturday, living history interpreters will be cooking in the mess hall and baking bread in the bakehouse with an interpretive program about the bakehouse at 10:00 a.m.
On Sunday, September 2, in the program “The Griffith Trial: A Marais des Cygnes Conviction”, Park Ranger Robert Thomas will lead a reenactment of the trial of William Griffith, the only man to be convicted of the Marais des Cygnes Massacre. This quote from Martin Luther King can be applied to the workers of modern times as well as those who labored to build and maintain Fort Scott. A special tour on Sunday “From the Crack Post of the Frontier:” will focus on the labor force, building materials, architectural styles, and construction techniques used in the building of Fort Scott. Programs on Monday, September 3 will include a Labor Day construction demonstration, musical programs offered by the Holmes Brigade Minstrels and free ice cream at 2:30 p.m., served to honor all those who have worked hard to build America. The ice cream is being offered courtesy of the Friends of Fort Scott National Historic Site. FORT SCOTT, Kan. – If you’ve got a classic show car you’d like to show off, Fort Scott Presbyterian Village is giving you an excuse September 13. The senior living community will be hosting a car show from 4 to 7 p.m. Shine up those whitewalls and polish that chrome because prizes will be awarded for first, second and third place winners. Come out and enjoy hot dogs, chips, and drinks while wandering through a collection of classic cars. RSVP to Becky Kellum, marketing director, by Sept. 4 at 620-223-5550 or rkellum@pmma.org. Fort Scott Presbyterian Village has been offering independent and assisted living apartments for seniors from southeast Kansas and southwest Missouri since 1994. Learn more at FortScottPresbyterianVillage.org. 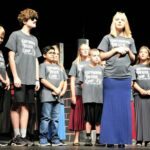 It is a member of the nonprofit Presbyterian Manors of Mid-America network of 17 communities and 2 hospices in Kansas and Missouri. Learn more about PMMA at PresbyterianManors.org. 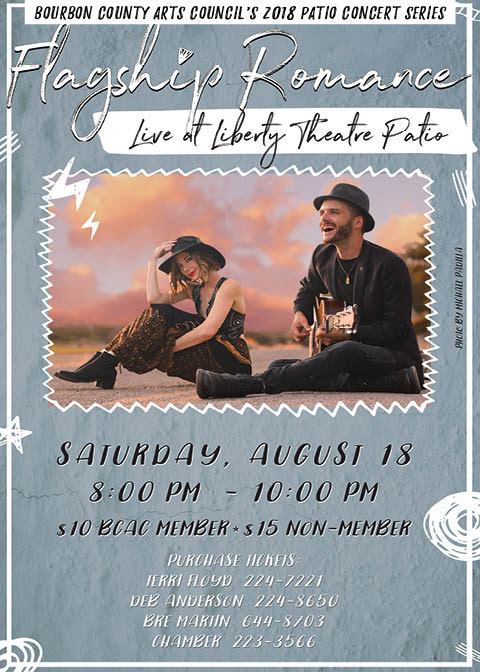 You do not want to miss out on the live performance by Flagship Romance at Liberty Theatre Patio! Great music and even greater memories to be made! 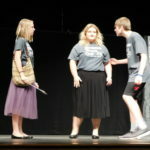 Terri Floyd, or Deb Anderson! 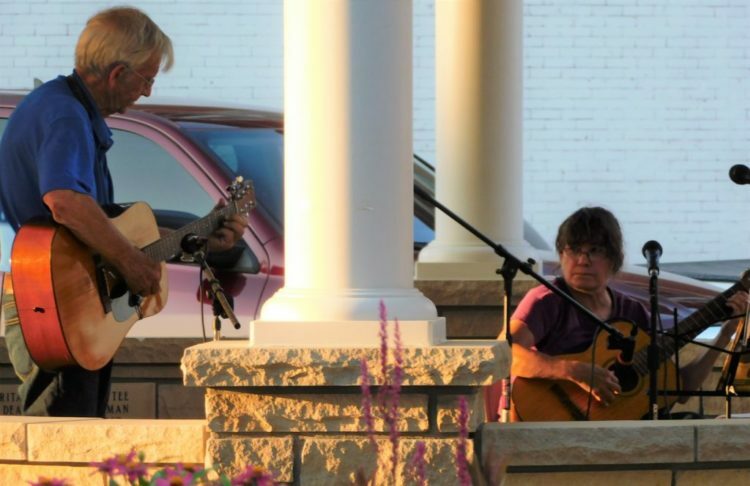 Ralph Carlson and Tammy Helm play as part of the Friday Night Concert on August 3. 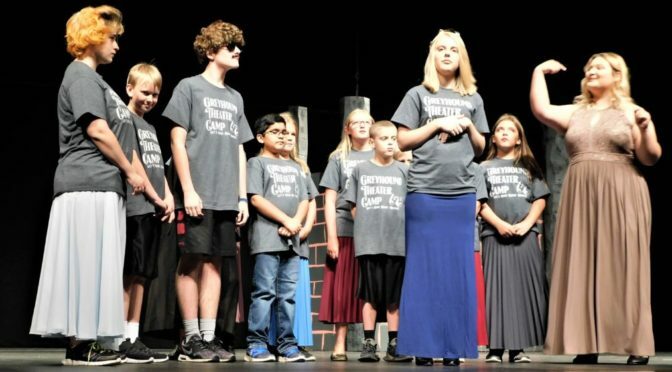 The Hemphill Family and Friends will be the featured act at this week’s concert at Heritage Park at 7 p.m. 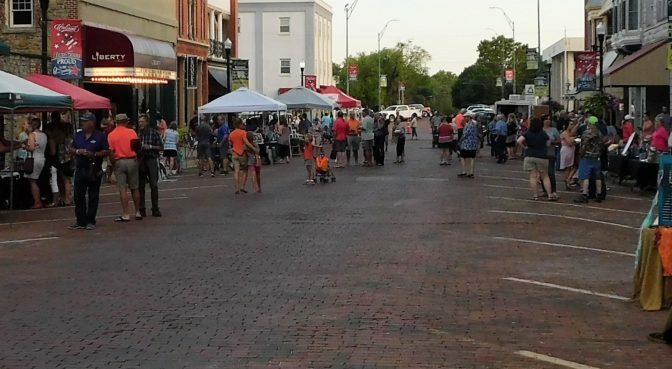 The weekly Friday Night Concert is at First and Main Streets and is free and open to the public. Ralph Carlson is the organizer of the concert series, which is sponsored by the Fort Scott Chamber of Commerce. Attendees are asked to bring lawn chairs. Lawnchairs line Main Street at for the Friday Night Concert on Aug. 3. Lawnchairs also filled the area in front of and to the side of the pavilion. 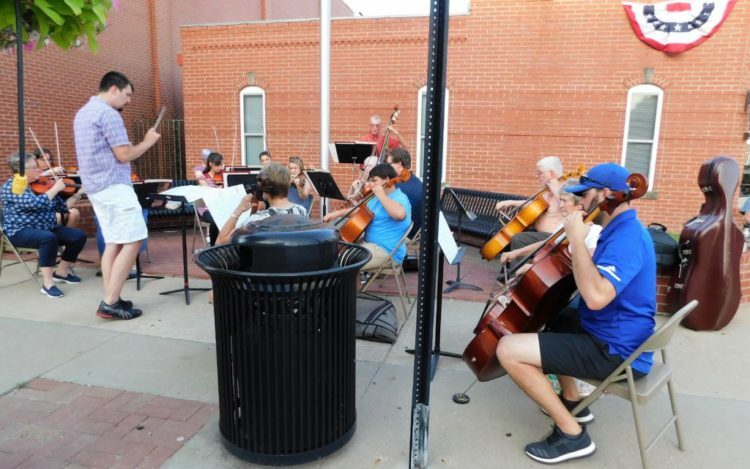 Several area musicians entertained the audience at this concert. Shane Walker, Fred Pather, Olivia Walker and Deven Coulter at the Gunn Park Pump Track Sunday morning. Something new has been added to Fort Scott’s biggest park. With no sign to designate the spot, it looks like piles of dirt on the south side of Park Avenue, just before entry to Gunn Park. Prather, Shane Walker, and Frank Halsey started physical work on the new Gunn Park Trails Pump Track about four months ago. 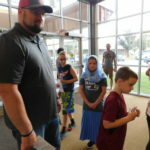 “The project was started last year, as a result of a grant from Timken (a local company), allowing for the purchase of the property,” said Frank Halsey. Mid-Contenintal Restoration donated the dirt and the City of Fort Scott brought the dirt in. Then the workers began piling into small hills with which to hone biking skills. So, what is pump track racing? 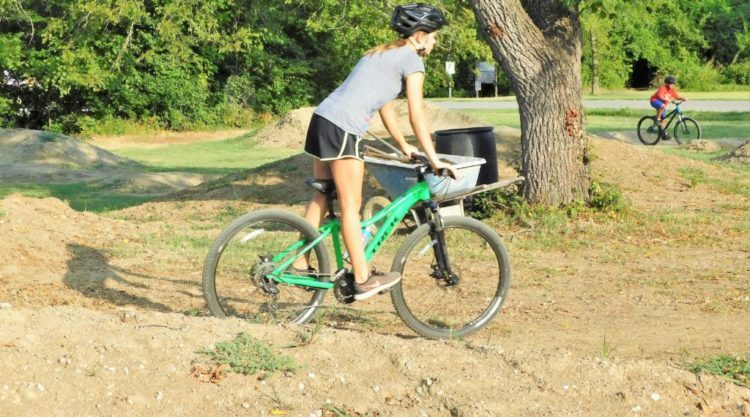 “Pump track translates from the rider pumping the bike with his arm and legs to maintain and even create momentum,” Prather said. Olivia Walker rides on the pump track Sunday morning, Deven Coulter is in the background. To create the local Gunn Park Pump Track, Prather did his homework. “I grew up riding BMX and ride mountain bikes now and I am involved with Gunn Park Trails and other bike projects in town,” Walker said. There is a beginner course on the far south side of the property. Eventually, there will be a sign with safety rules and “possible billboards behind the hills,” Prather said. “And grass will be sown on the side of the hills.” He also envisions bleachers for spectators. 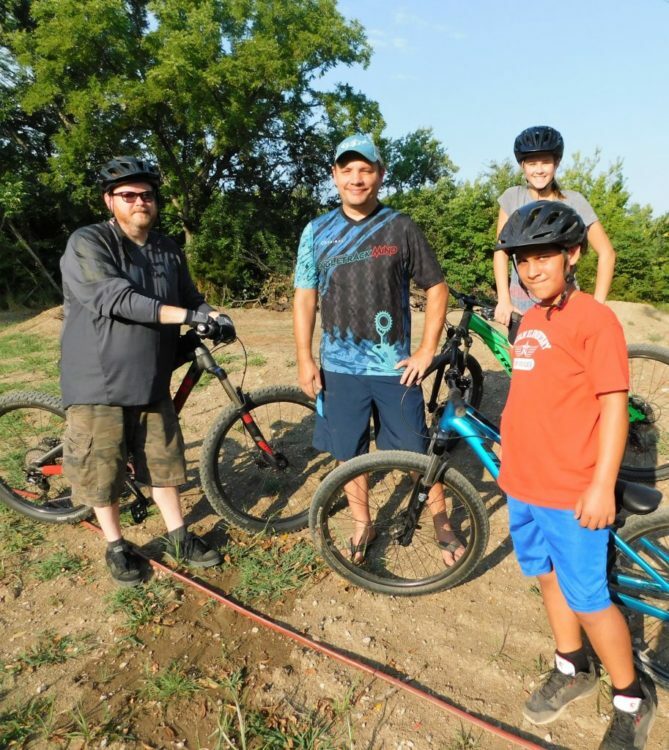 “We started to feel a need for BMX style riding and to allow mountain bikers access to a pump track which is an activity becoming increasingly popular,” Shane Walker said. 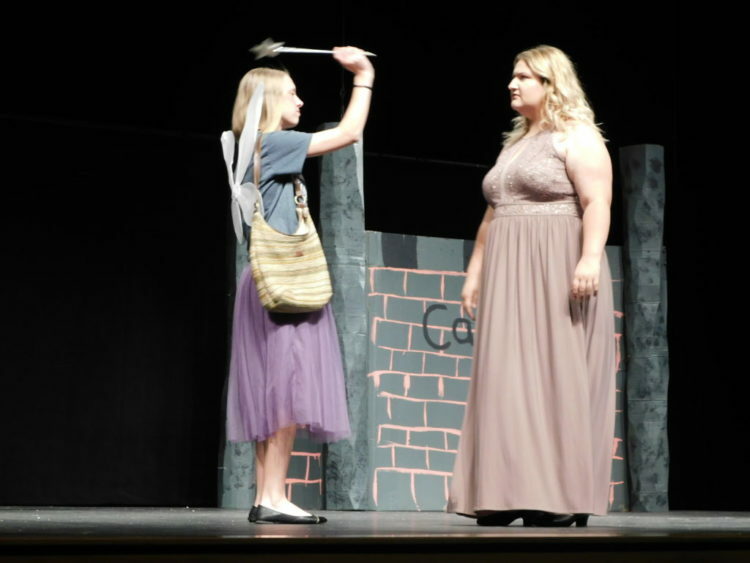 Fairy Morgan Eaton kept the audience apprised of what was going on in the story. 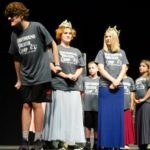 Culminating four weeks of a children’s summer theater camp, 17 local children under the direction of Allen Twitchell presented Beauty IS A Beast, Wednesday evening. The story is a twist of an age-old story of what constitutes real beauty. 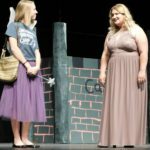 The play is a parable in six scenes set in the kingdom of Callentine and will be presented again Thursday evening at 7 p.m. at the Ellis Family Fine Arts Center at Fort Scott Community College. 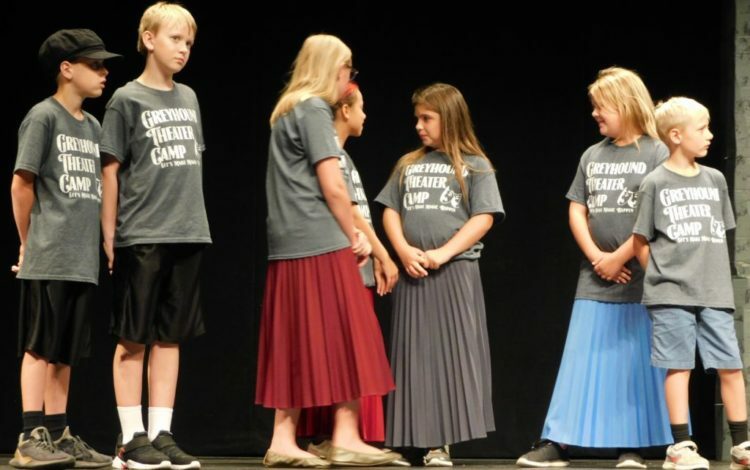 Camp participants received instruction in theater basics and engaging in theater exercises. 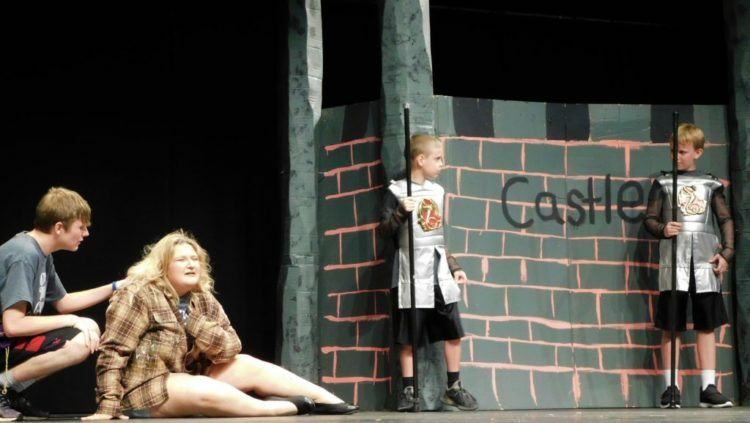 The play was presented in a workshop style, with minimal set, costumes, and props. 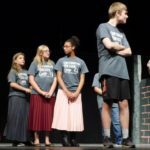 The crew consisted of Twitchell as director, Jared Oshel at production assistant and well as set design and construction, Ivy Bailey also helped with set design and construction. 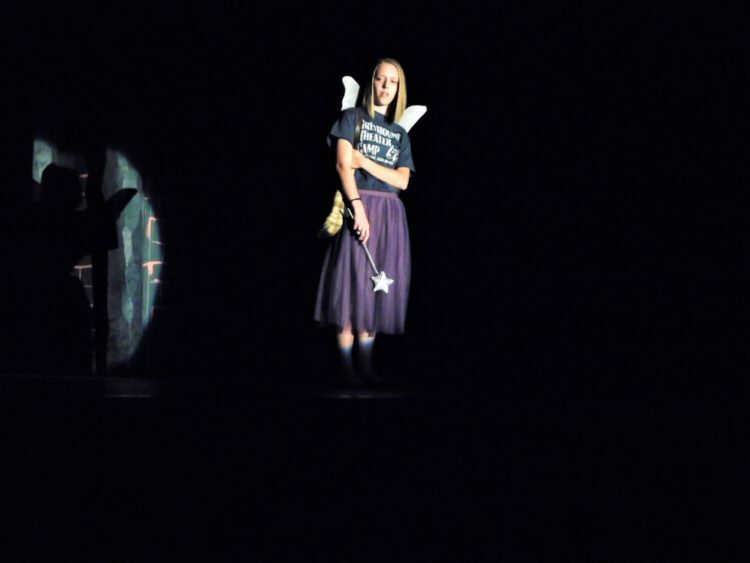 Publicity was by Kassie Fugate-Cate. 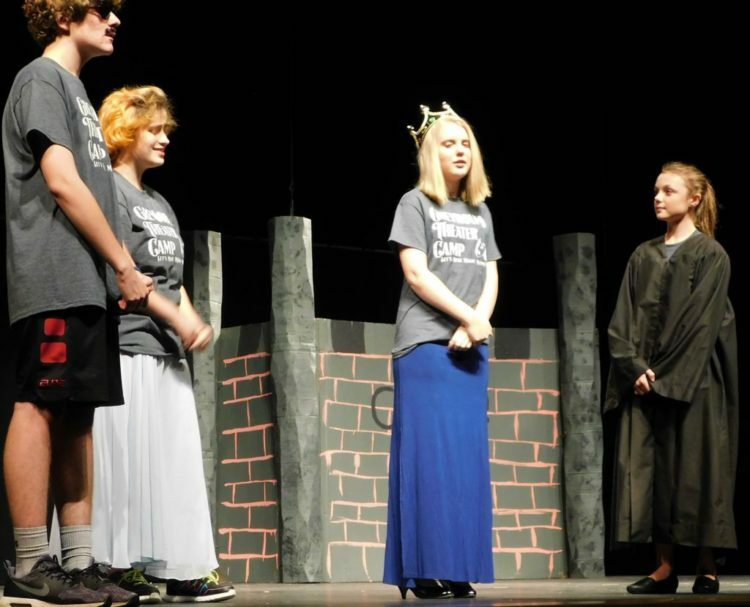 The cast, in order of appearance: Fairy-Morgan Eaton, Beauty-Kaitlyn Hanks, Sarah/Molly/Jo-Analeise Rupprecht, Tutor/ Janie- Jordyn McGhee, Guard/John-Vladimir Clark, Guard/Sam/Joe-Matthew Eaton, Scribe-Cadence Tuck, Honor-Wendy Monahan, Andres/Nick-Jakob Slinkard, Meg/Patty-Alyssa Shelton, Kelly/Sally-Madalyn Willet, Queen-Natalie Eaton, Mayor/Peter-Raj Gugnani, Jill-Ivy Bailey, Bill/Jimmy-Micah Hunt, Mandy-Alyssa Hunt. 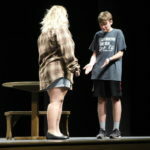 Aubrie McGhee was ill Wednesday evening but had practiced as Mary/Cindy in the play. 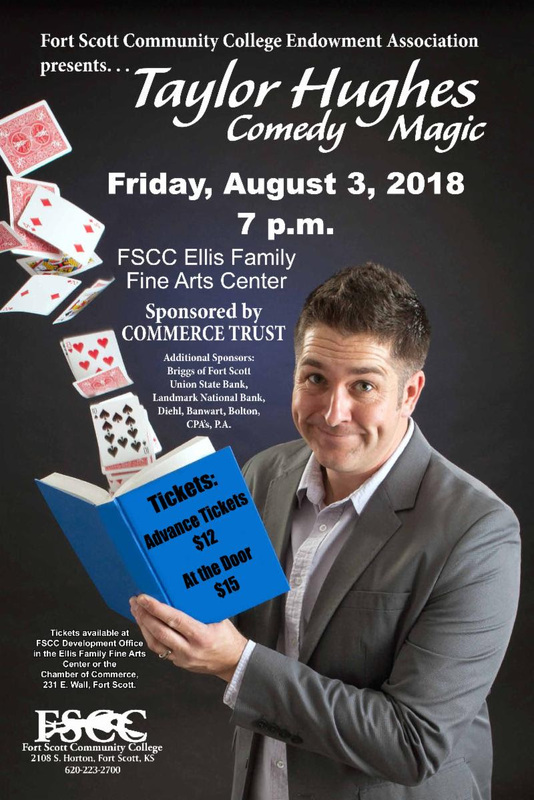 Join us to watch the live production of Taylor Hughes Comedy Magic on Friday, August 3rd at 7pm! You may buy your tickets in advance at the Fort Scott Area Chamber of Commerce! 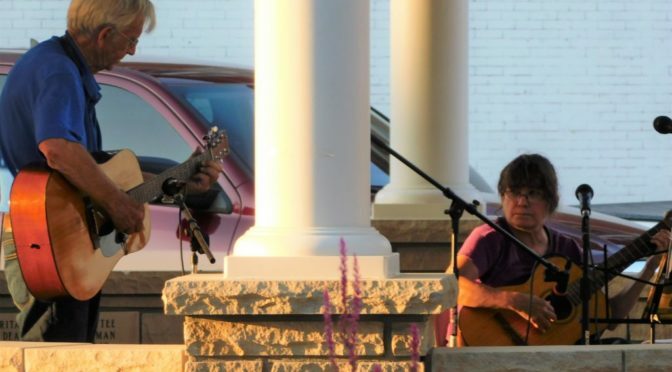 Taylor Hughes is a full time entertainer with over 20 years of performance experience. He is one of the only people to have performed in all three showrooms at the World FamousMagic Castle before the age of 21. He is a featured act on the television series “Masters of Illusion” and was recently presented the awards for “Best Illusion” “Best Comedy Magic” & “Best Showmanship” by the Society of American Magician’s in Los Angeles. A popular entertainer, Taylor has performed for multiple organizations including Home Depot, AT&T, and The American Heart Association. 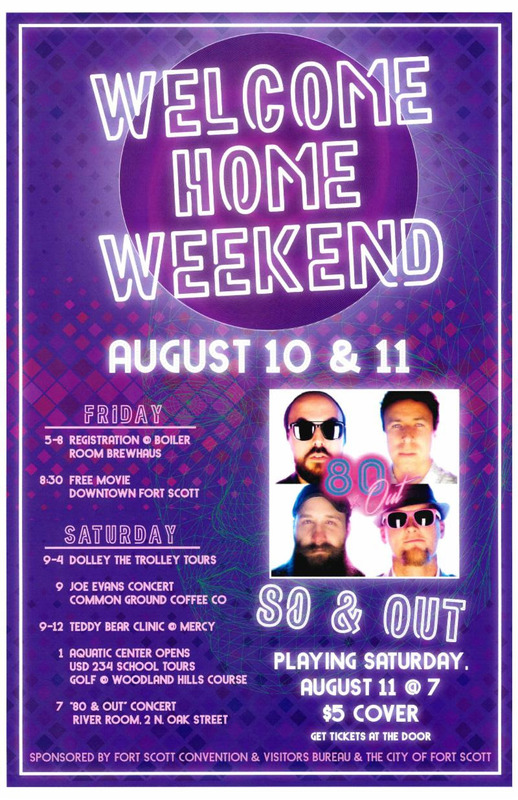 We ask everyone to come to celebrate “Welcome Home Weekend” on August 10 & 11. You do not want to miss out on two full days of fantastic events that even includes a live performance from 80 & Out at the newly reopened River Room! 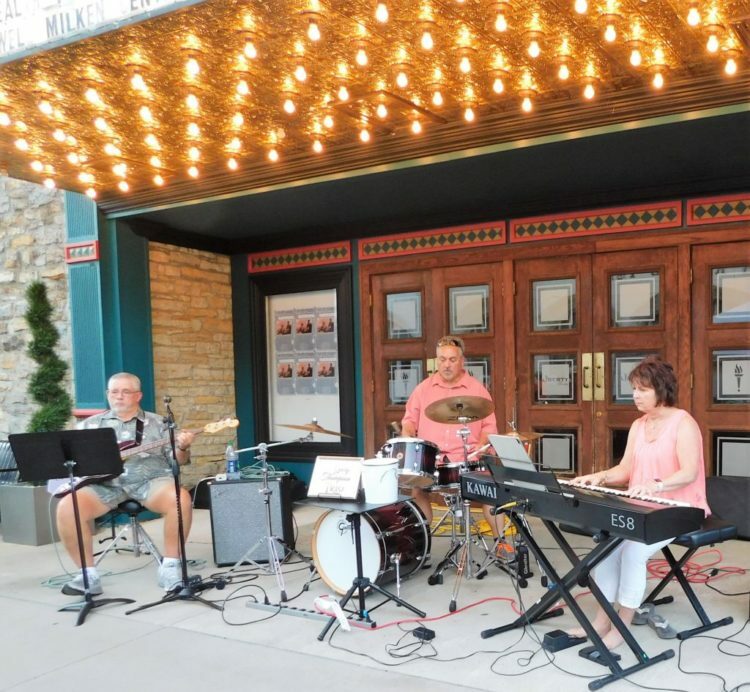 The Gary Thompson Trio performed Friday evening as part of the art walk and wine stroll. 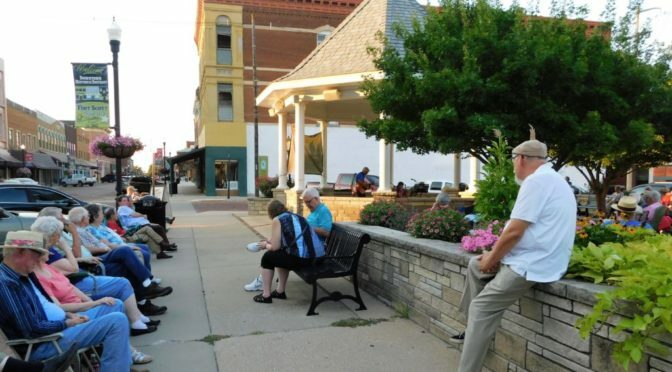 Carsen Felt leads the community orchestra Friday evening during the wine stroll/art walk in downtown Fort Scott. 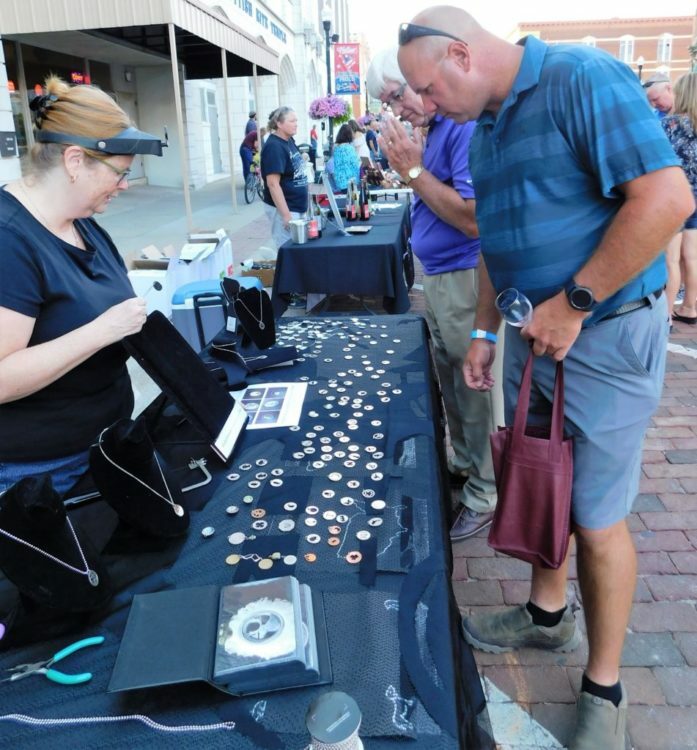 A local jewelry artist displays her creations. 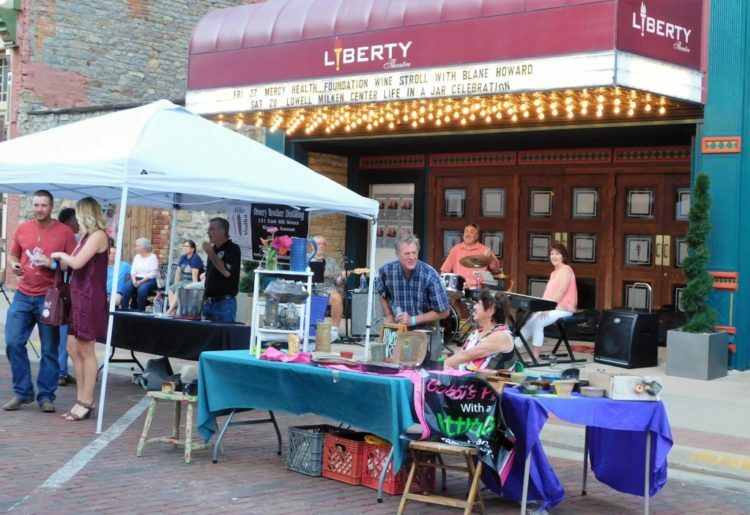 Bobbie Kemna, local pottery artist chats with Dave McCord at her booth Friday evening. 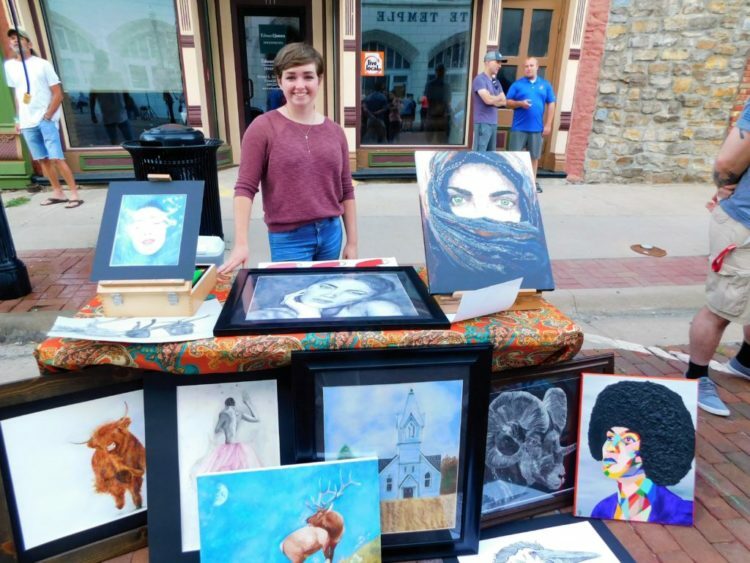 Local artist, Jacey Bowen, displays her art at the art stroll. 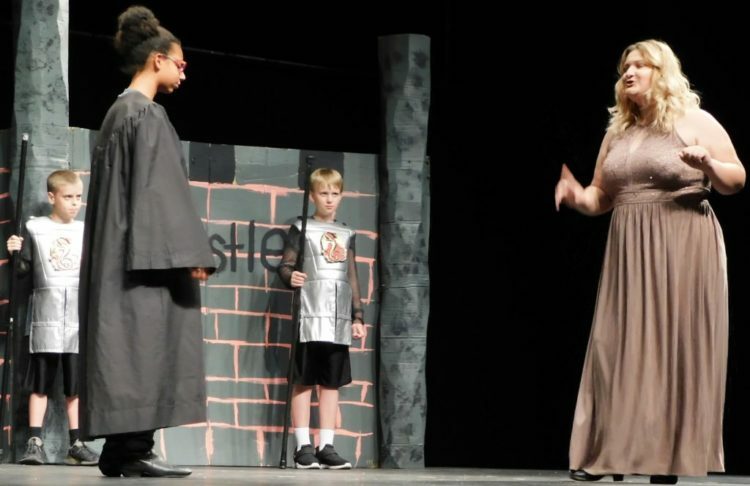 Bre Martin, a member of the Bourbon County Arts Council, watches Carter Campeau, Ballwin, Mo. color a paage set up for budding artists. 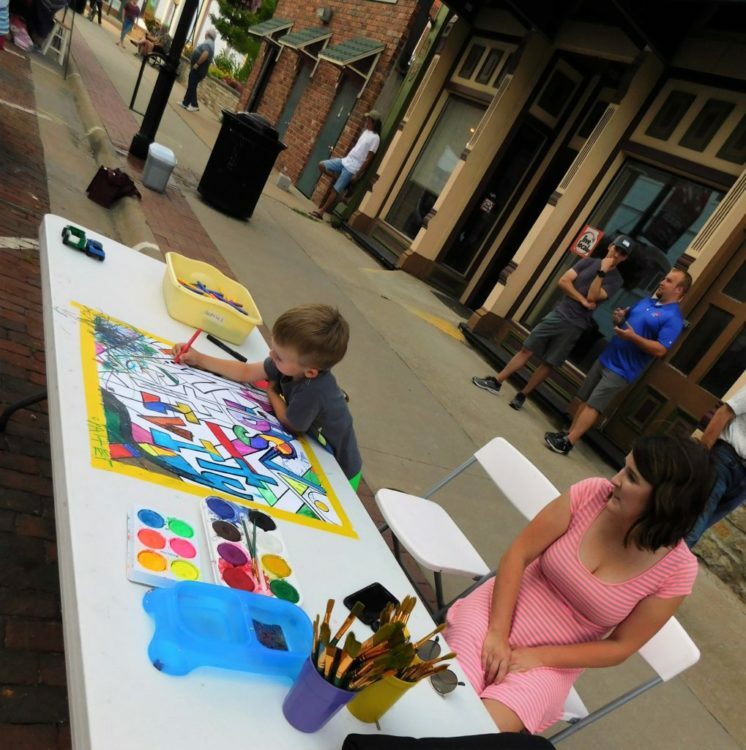 The BCAC provides children activities at the art walks they organize. Aubrey Vineyards™ is a native Kansan family owned and operated winery & vineyard. From south Overland Park, diligent work is helping to revive the wine industry that once flourished here in the 19th century. The small batches of premium, hand-crafted wine capture this native, pioneering spirit. Aubrey Vineyards now invites local wine drinkers to meet modern Midwestern winemaking at its best. The tasting room and store is open daily (Mon-Fri 10-7, Sat 10-6 and Sun 12-5) and is located in downtown Overland Park, inside the Vinyl Renaissance & Audio record store. (913) 579-5004. Fort Scott has a rich history of brewing great beer and has been for many years. At the Boiler Room Brewhaus, we believe that it’s about more than great craft beer, it’s about providing an atmosphere where people can grow closer and strengthen our community. Your local brewery is located in the historic Downtowner Motor Lodge on the corner of Wall St. and National Ave. The building was built in the 1950’s and looks brand new. We have several beers that rotate through the tap room, most are named after our farm animals or tractors. We would love for you to visit our microbrewery and become a part of our community. The Boiler Room Brewhaus is owned and operated by the Ritter’s who live on a little farm in Garland, Kansas. Flustered Blonde Vineyard and Winery is an established farm winery owned and operated by Kim & Tim Bogner, located in Parsons Kansas, a small rural southeast Kansas community. Our premium wines are blended to capture the distinctive flavors of the grapes to produce a pleasurable wine tasting experience. The tasting room is open to the public Saturdays from noon – 6 p.m. and Monday through Friday by appointment. For a private appointment, call (620) 605-8485 or (620) 820-1704. Fossil Springs is located atop giant limestone, on a farm in Miami County, Kansas. Through the years, underground springs have carved their paths into these stones, exposing fossils that were deposited centuries ago. One of the things the owners Mark and Christina Allison do on their farm is raising elderberries for their wine. The Elderberry wine is made with 100 percent elderberries, no other fruit is added. The wine is uniquely rich in flavor, aroma, and color. Located in southeast Douglas County, Haven Pointe Winery reflects the spirit of the Kaw River Valley – rustic, natural and bold. Our mission is to provide a truly unique experience that brings together great wine, good folks, and hands-on viticultural and enological knowledge. Haven Pointe Winery produces both red and white French-American hybrid varietal wines. Our estate-grown varietals include Chambourcin and Traminette. We also make fruit wine as well as a variety of meads. Each of our wines features Kansas-grown grapes, fruits and/or honey. Ornery Brother Distilling was born out of Tim Kyle’s passion to develop a unique product from white sorghum grain. Over the past two years, he has done just that! The business model is simple: There is one guy and this solid grassroots Kansas product: Milo Vodka! Distilled, bottled, boxed, and out of his door to yours with pride & humility! He believes in using and reusing what is available and simplifying production, with integrity given to the “process”. It is Gluten Free & no sugar added! We capture originality for that one-of-a-kind, unique blend crafted to please every palette. We have 5 award winning wines in our collection: Sweet Lady, River Valley Red, Pink Catawba, Christmas Wine and Red Raspberry. We’ve been producing world-class wines indicative of our region of central Kansas since 1991. (785) 825-8466. TJ’s Brew is a handcrafted spirit fashioned by a Southeast Kansas farmer. You can trace TJ’s brewing ancestry back through the moonshine swappers in the prohibition, all the way to his great-great-grandfather who sailed from Germany to America with grapevines in hand. Today TJ aims to make his mark on the industry with a collection of fine spirits. The tasting room is open to the public Saturdays from noon – 6 p.m. and Monday through Friday by appointment. For a private appointment, call (620) 605-8485 or (620) 820-1704. Wine Drizzle is a unique wine topping for a variety of food from pancakes and crepes to cream cheese, sponge or vanilla cake, ice cream, oatmeal or your finger. They can be used as flavorful toppings, glazes, and dips too. There are both sweet and savory varieties! 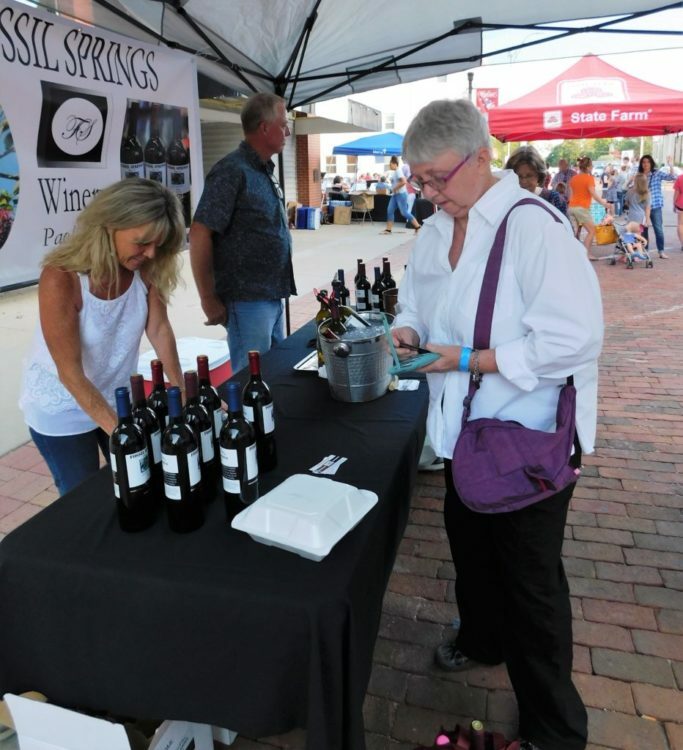 All of getting Drizzled’s Custom Wine Drizzles are true wine reduction sauces which means they are non-alcoholic due to the cooking process so anyone can enjoy them straight out of the bottle. The outside pickleball courts are located up the stairs, just north of the water tower at 9th and Burke streets. It is a cross between tennis and ping pong and was invented in Seattle in 1965. 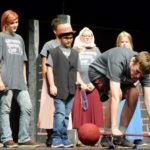 Played with a short wooden paddle and a whiffle ball, in Fort Scott there are two places to enjoy the sport. 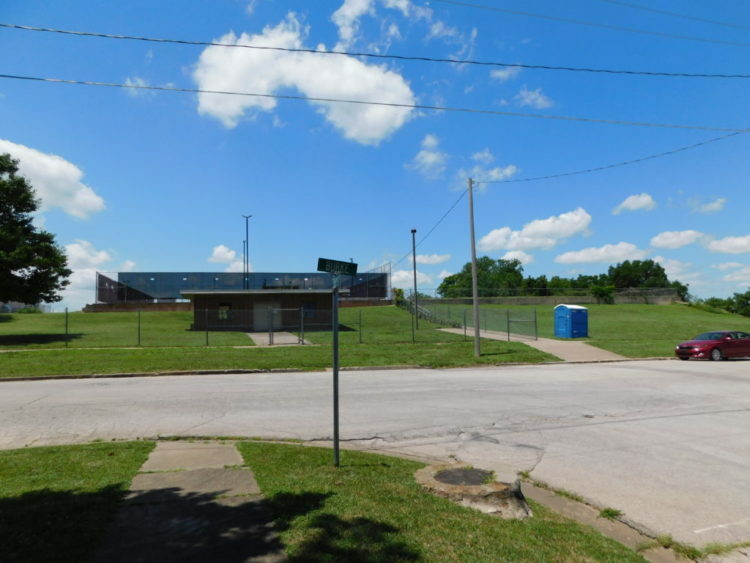 One is indoors at Buck Run Community Center, 735 Scott Avenue, and the other is an outside court at 9th and Burke street, near the water tower. Paddles and balls are available at Buck Run. The outdoor courts are a first-come, first served basis. “We are lucky we have two places to play,” Janice Allen, a local player said. 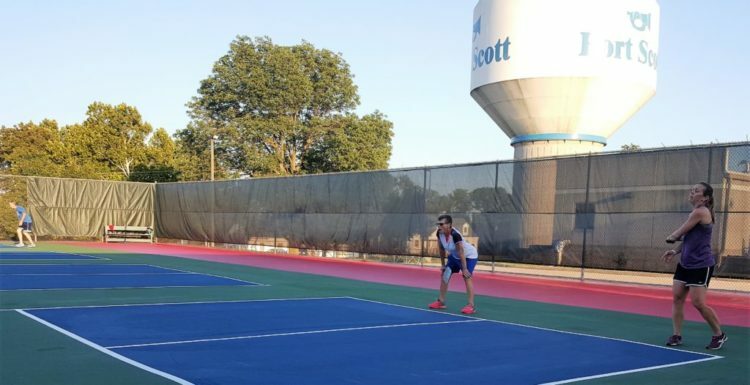 Pickleball is taught as part of the physical education curriculum at Fort Scott Middle School, “And all kinds of kids show up at the water tower to play,” Allen said. 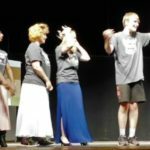 Teams can be found playing at the outside court at 6:30 a.m. Tuesdays and Thursdays and also at 6 p.m.
At Buck Run, 9 a.m. Monday through Friday people play and also Saturday morning at 8 a.m., she said. There are four courts at the water tower site. “I’m 77 years old,” Allen said. 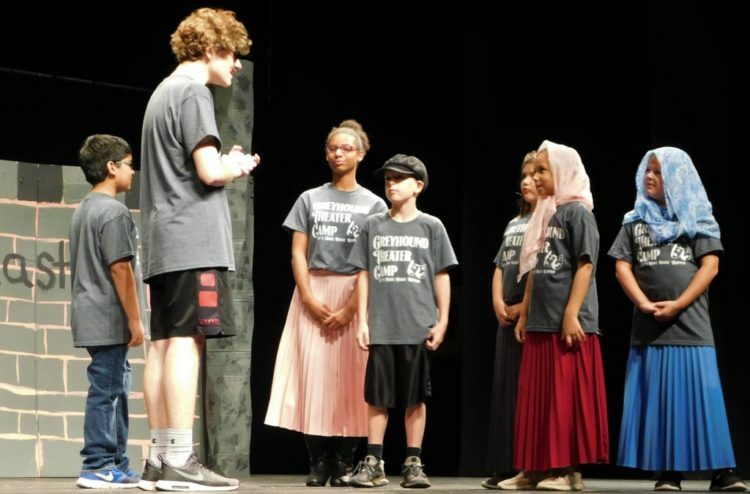 “It’s an excellent exercise and social game. And I’ve lost 25 pounds since I started playing a year-and-a-half ago.” The outside court opened in 2017. 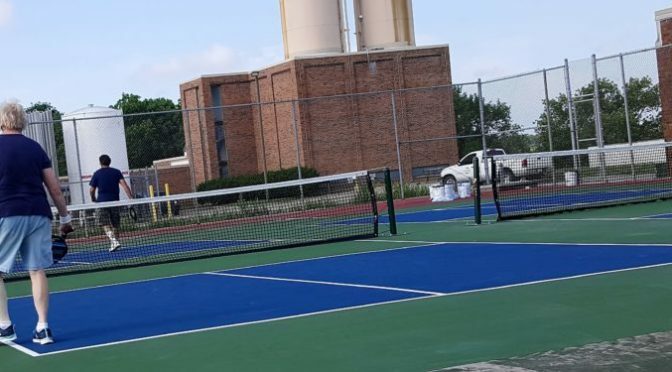 The pickleball court is two-thirds the size of a tennis court, scoring is like for ping pong, serving is underhanded and a person can only score while serving. There are four courts at the water tower location. Submitted photo. Pickleball can be played outside at night as well because of lights at the court. “You need to wear shoes with tread, cross-training shoes, not running or walking shoes,” she said.